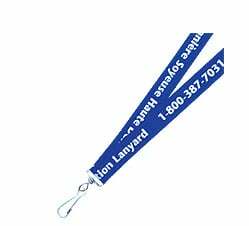 /8" and 3/4" (3/4" shown), 3-breakaway style lanyard for the best safety in case the lanyard is caught or snagged. Thick Satin Braid Neck Cord. Dye sublimation printing. Swivel hook for card attachment is shown. Other attachments include bulldog clip, plastic hook, split ring and others. 1-breakaway style also available.